← Why I did all my New Year Resolutions at Christmas. Recently on the 29th December, a remembrance service was held in Canterbury Cathedral. The service is held every year as it has been for centuries, in memory of one of most dramatic and tragic figures of early Medieval English history, Thomas Becket. 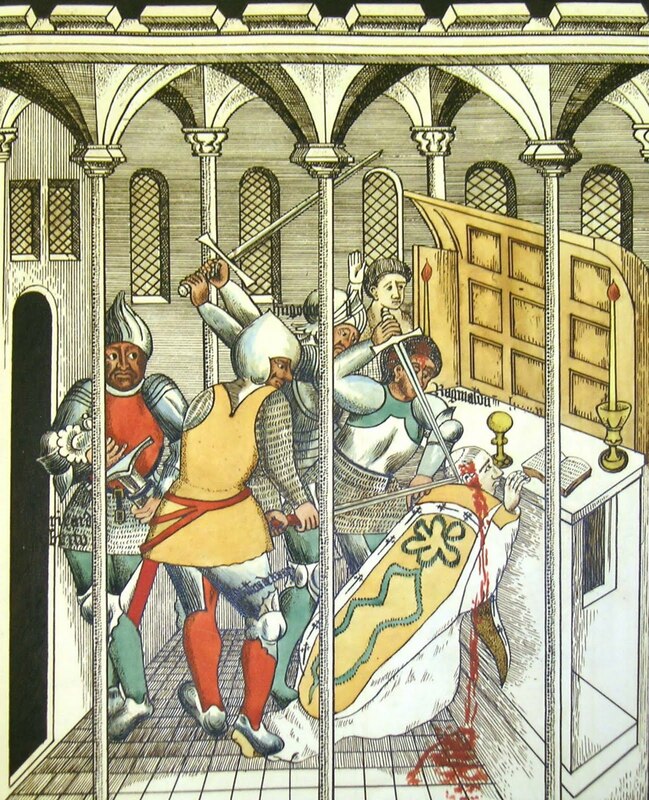 The death of Thomas Becket. is one of the most dramatic and well-known moments of English history of this period and whereas I have previously written about The Magna Carta which occurred a few decades later, this is definitely a highlight, in name only. Thomas Becket, the Archbishop of Canterbury did at one time have very good relations with King Henry II of England and indeed even cared for his son for a time. However Henry II was a very ambitious and ruthless ruler. He wanted to increased the size of his kingdom by conquering much of Ireland and with his conquest of most of France did have a considerable empire by the standards of the day. Most importantly, King Henry II wanted to increase his own personal power within England and these powers would make him what we would today called a Despot, tyrannical even by the standard of Europe of the time. In order to get these powers it was necessary that he obtain the consent of amongst others, his clerics to loosen the ties between Rome and the English church. It took a great deal of effort. Henry II was a very unpopular King at the best of times but eventually after much effort and no doubt physical persuasion, only the Archbishop of Canterbury, Thomas Beckett declined to sign the Constitutions of Claredon which would have given Henry II all that he desired. On the 8th October 1164, Thomas was summoned to a grand council at Northampton Castle and when it was made clear that he faced persecution, he fled to continental Europe where he was for a time granted the protection of King Louis VII of France. Henry II started persecuting the supporters of his Archbishop and Thomas started rapidly ex-Communicating his opponents in England and but for the intervention of The Pope was going to ex-communicate the entire Kingdom. It must be remembered that in these times anyone who was ex-communicated was thrown out of the Church and thought to be condemned to eternal hell and damnation upon their death. Eventually a Papal commission arbitrated on the matter and King Henry allowed his Archbishop to return to Canterbury in England. However months later, Thomas learned that new coronation was to be made wherein the young king (to be) would be coronated by the Archbishop of York and the Bishops of London and Salisbury. This was a clear breach of Canterburys unique privilege to crown monarchs. As such Thomas ex-communicate the three senior churchmen who immediately complained to the King. Some have argued that King Henry never ordered the assassination of his Archbishop, Thomas Becket. Most popularly he is attributed to have asked “Will no-one rid me of this turbulent Priest“? Yet be that as it may, it was here when whatever words were uttered compelled 4 loyal knights to head to Canterbury. The 4 Knights; Reginald fitzUrse, Hugh de Morville, William de Tracy, and Richard le Breton, arrived in Canterbury on December 29th 1170 and are said by monks to have left their weapons and armour under a tree. They ordered Thomas Becket to go with them to the city of Winchester to testify to the King, something that most likely would have led to the execution of the Archbishop. With the refusal of Thomas to travel with them, the Knights headed out to retrieve their weaponry and armour. The Cathedral was thrown into panic, the monks pleaded with their Archbishop to board up the doors and make a barricade but Thomas stated that he would not turn the House of God into in a fortress and besides which he was preparing for a service. The Knights strode in with their swords drawn when the monks were already chanting. The most famous of though one of several Archbishops murdered and executed. The best and most vivid account of the deeds are better than I could hope to write and so here they are from Edward Grim, a witness of the attack and someone who was himself wounded by the knights. The 4 Knights immediately went into hiding for a year in remote parts of northern England and Scotland. They were never punished for their crime. Just years after his murder, people were travelling on pilgrimages across Europe to visit the spot of his death and pay tribute at his shrine. Soon miracles were reported by those sick and invalid who travelled and prayed at Canterbury and so his fame rose. A huge number of objects closely associated with Thomas were spread around the kingdom and Europe, bits of clothing, strands of hair, teeth and bone. As such he is venerated as a Saint and a martyr by both Catholic and Anglican churches. King Henry II immediately regretted his actions or at least appeared to in order to curry favour. It is hard to imagine how shocking it must have been to people for an Archbishop to have been murdered in his own cathedral whilst preparing for a service especially in a country where Churches even to this day are considered sanctuaries much in the way as foreign embassies are. William of Newburgh said of the king that “in his own time he was hated by almost everyone“; he was widely criticised by his own contemporaries, even within his own court. To avoid Ex-Communication by The Pope, King Henry II was committed to go on Holy Crusade, something which he never did. Thomas Beckett was a particularly pious man and was said to have even worn an uncomfortable hair-shirt designed to irritate the skin under his clothes to remind him to be penitent to God in everything he did. The king performed a public act of penance on 12 July 1174 at Canterbury, when he publicly confessed his sins, and then allowed each bishop present, to give him five blows from a rod, then each of the 80 monks of Canterbury Cathedral gave the king three blows. 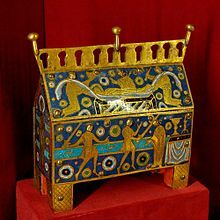 The king then offered gifts to Becket’s shrine and spent a vigil at Becket’s tomb. However he was forever haunted by his terrible actions until the day he died a lonely and rather painful death in France where he remains buried and forgotten in isolation compared most other English and British monarchs. If anything these events were a pre-cursor of Henry II’s more infamous descendant, King Henry VIII who was even more determined that he be the sole authority in his realm, even above that of Papalcy in Rome. The fact that Henry VIII dismantled the shrine of Thomas Becket centuries later says everything that needs to be said. Many are of the opinion that the King had the bones of Becket burned in the Tower of London at the same time he stole 26 wagon loads of treasure from his cathedral but it is hard to imagine that the pious monks of Canterbury would not have found a way to swap his bones and secretly bury them elsewhere, the location of which has been lost in time. 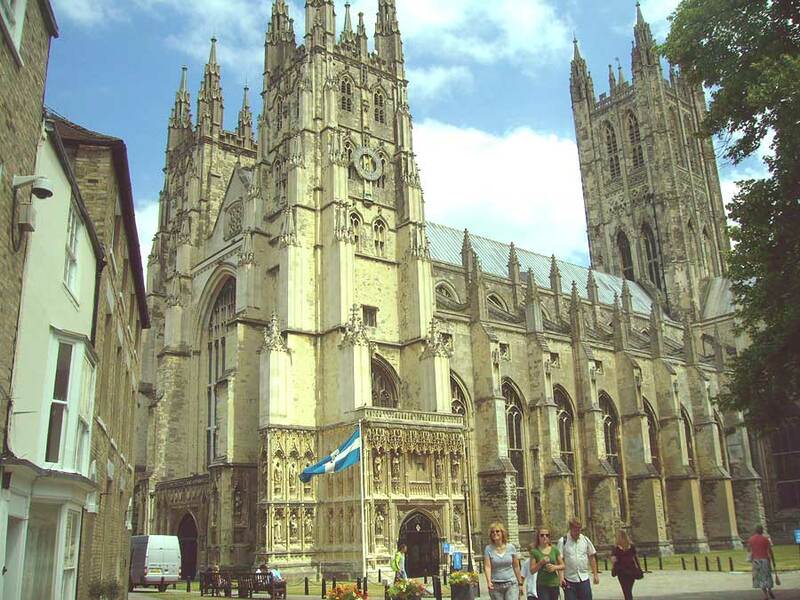 Even now, Canterbury is legally and possibly architecturally speaking, the grandest Cathedral in Britain. Hidden away as it is in the extreme South-eastern corner of England but so close to Europe it bears testimony to the religious, historic and cultural importance of the ties between Canterbury and the wider Christian world. 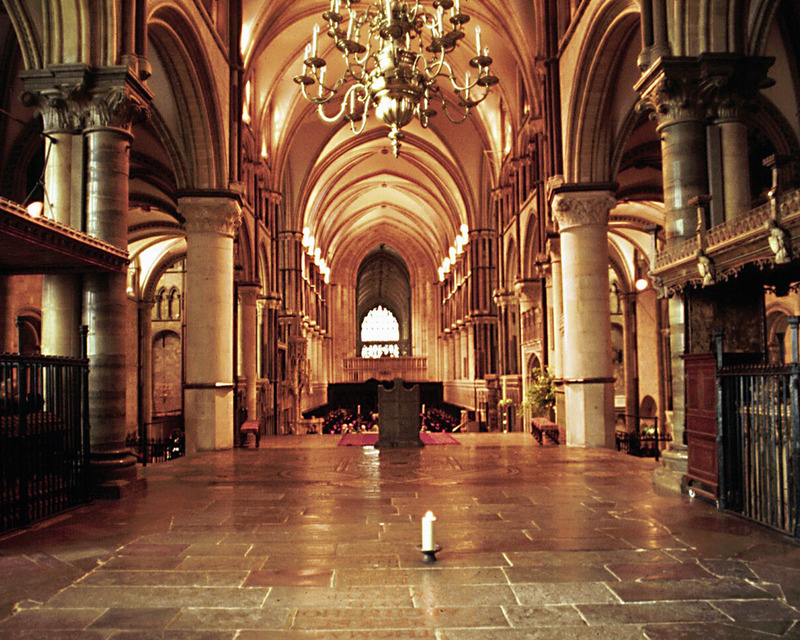 Pilgrims still visit Canterbury to the spot of martyrdom and the site of the former Shrine of Thomas Becket, now marked by a simple candle of remembrance. Pilgrims are out numbered by sight-seers and tourists but whatever their religious persuasions perhaps everyone can agree on the bravery and whole-hearted commitment to his beliefs that Thomas showed. He knew he was likely to die anyway and so he sort to make a stand that would shock the world and draw attention to his cause. Whether God exists in the world at large, in the Cathedral or just in the hearts of visitors, the simple acts of Thomas Becket have lived on long after the heinous King has largely been forgotten. Canterbury Cathedral is a magnificent building in a very pretty small city 100 odd miles East-Southeast of London and makes for a wonderful day out on its own or with a trip to nearby Dover Castle. If you enjoyed this post you might like my book 101 Most Horrible Tortures in History which has a tongue in cheek take on punishments and tortures and available in paperback as well as through Amazon, iBooks/iTunes and Kobo worldwide. This entry was posted in Architecture, history, Religion and Faith and tagged Cathedrals, churches, Culture, history, holidays, King Henry II, Long reads, pilgrimage, religion, Thomas Becket, Tours, Travel, Ye Olde England Tours. Bookmark the permalink. Hi Stephen, I was lucky enough to get to go to the cathedral for a very quick stop of a tour. It is really beautiful. Thanks for posting the history. I actually have a friend that is related somehow to one of the dastardly knights! Yes, I will find out which knight it was, he knows the name. He also told me that the king, as part of his penance, crawled miles to the alter where Beckett was hacked to death because everyone hated him after it happened. Interesting. Thanks, I just did. I look forward to your email! I love your post and very readable way of telling the history. I remember bneing taken to Canterbury Cathedral when I was very young and I have always been fascinated by the story of the Murder there. I am intrigued to read that other archbishops were murdered or executed. Who were they? Thank-you for stopping by my blog, I’m glad that you are enjoying it. I visited Canterbury Cathedral for the first time last November and it was an amazing place. I had no idea that Thomas a Beckett lived in Sicily or that there are still connections to him there. Probably the most unfortunate Archbishop to be murdered was Alphege who was captured by the Danes when they invaded in 1012. They stayed in Kent for a year pillaging and doing their stuff and the Archbishop refused to pay a ransom for his freedom. He was killed by a Dane who he had only converted to Christianity earlier that same day! Several died of horrid disease or tiredness from travelling to Rome or the Holy Land. Simon Sudbury was killed by Wat Tyler’s peasants revolt and beheaded… his mummified head is still on display in Sudbury, Suffolk. I am really looking forward to reading more. Governments and Christian churches have never really got on, have they? Too much alike is some ways, perhaps. No they haven’t. Nothing much has changed. The governments still pretend they are act in a good way but never like it when the churches tell them otherwise! An excellent Post on an intriguing subject, well done! Thanks for Liking my new Blog: lordsofbramber. Cheers! Coronated is a real word 🙂 It is a simple past tense and past participle of coronate.